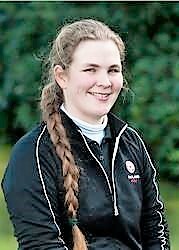 West Lancs Golf Club member Hollie Muse, a freshman student at Daytona State College finished T28 in a massive field of 120 players at the Augusta Invitational women's college 54-hole tournament at Forest Hills Golf Club, Augusta (March 16 to 18). Hollie, pictured, had scores of 78, 76 and 70 for a total of 224 over a par-72 course of 6,228yd. Muse's last round, which had birdies at the seventh, 12th and 16th, offset by ne bogey, at the eighth, was one of the lowest on the final day. Jillian Hollis (Georgia) was the individual winner with rounds of 66, 73 and 69 for eight-under 208. She finished three ahead of runner-up Fernanda Lira (Central Arkansas) who had scores of 69, 71 and 71 for 211. Georgia also provided the winning team in a field of 15 squads. They won by nine strokes with a total of 864. Joint runners-up on 873 were Purdue and Augusta. Daytona State College (890) tied for sixth place.